Most of the time, I don’t use props. Why? Because I think YOU should be the focus of your pictures. However, sometimes a special prop can bring out your personality or add uniqueness to a photograph. For that reason, I have partnered with a local antique dealer, Carolina Retro! Through this partnership, I will be able to get vintage props on loan or at very affordable prices. If there is something special you would like for your session, let me know and Carolina Retro will try to find it for us! 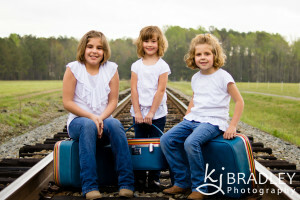 The cute girls in the photo below are clearly the focus of the picture but the suitcases enhance the railroad track look Mom wanted for this session. Don’t you think so? NOTE: This photo was taken in Spring 2012 and posted on the original blog. If you desire track pictures, ask your photographer about disconnected tracks. Never attempt to take photos on “live” tracks.